The following are detailed specifications about the Uttermost Malika Antique Silver Mirror. 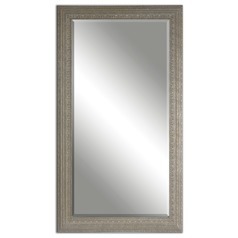 Transitional mirrorFrame Features An Antiqued Silver-champagne Finish With A Light Gray Wash. Mirror Is Beveled. May Be Hung Horizontal Or Vertical. This Uttermost Malika Antique Silver Mirror is part of the Malika Collection from Uttermost Lighting. The following items are also part of the Malika Collection.